While there are many Porsche forums, the one that keeps coming up in many forums is Reenlist. That is the one I would try first.
] That car will be more than 99% can handle going 8-9/10s. The same is true of the base C7. That's about right. I'm confident I can out-drive 80%++ of the civilian drivers I share the road with. But driving a high performance car like a C7 requires a skill set that few ever acquire, and VERY few are 'born' with. You have to be taught it and learn it on the track. My very limited track experience has taught me the most important thing you can know about driving: what you are NOT capable of. Sadly, the ME appears to be already out of my range to consider with no price increase from the C7..... Bottom line, with no GM incentives, I'm more then happy to keep my C7. Last edited by C7nut; 12-18-2018 at 08:30 AM. Sadly, the ME appears to be already out of my range to consider with no price increase from the C7..... .
How could anyone be sad that the ME price is too high when it's all speculation as to what it will be and price?? The title of this Thread is ridiculous, GM is not planning to close the Bowling Green plant! Look at the Kerbeck website, they have a number of new C7's listed for under $50,000! They will have similar ME discounts after a year or so! Last edited by JerryU; 12-18-2018 at 08:36 AM. You make it sound as though the C8 will cost less then the C7.....Unless the ME is a disaster I don't foresee similar 15%-20% discounts many C7 owners have enjoyed over the past two years to continue with the ME. I expect them to sell at sticker... That being said, if you read my post, with the new C7 price increase yesterday and with the ME expected to go at near sticker, the minimal equipped ME I would consider with NO price increase over the C7 will cost a minimum of $75K. Yep, if you want to be one of the "first on the block" with a C8, agree, as I said they will not be discounted as they will a year or so later! Last edited by JerryU; 12-18-2018 at 09:55 AM. Your guess at 75k makes absolutely no sense since you have no idea what standard equipment will come on the C8. 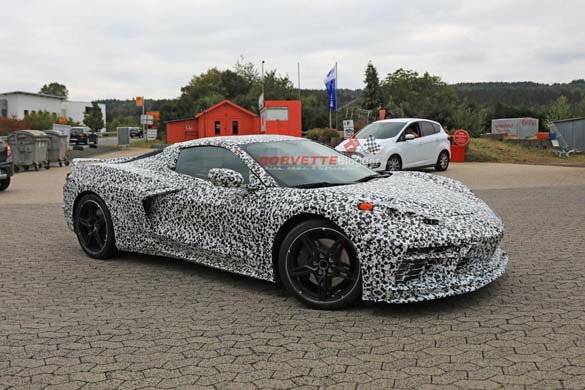 As far as discounts are concerned, unless the C8 is very limited production (which it wont be) there will be discounts galore after the first year just like all Chevy vehicles. The C8 will be no different in that regard. Unlike you, I don't believe in hypotheticals. I have no idea what the market price for ME's will be in one or two years.. . In my original post I posted what the new actual MSRP for a simple 2019 C7 Stingray Z51 coupe with the 2LT option and auto trans will cost with taxes, about $75K.. Add a transparent roof, Mag ride along with optional wheels and you'll be above $80K... If you believe a similar C8 comparably equipped will cost less, you're mistaken..
Last edited by C7nut; 12-18-2018 at 01:26 PM. a very nice starter home! We own a pretty nice 2 bed 2 bath with a great office in Ocala Fl. it was recently completely updated. Real estate wants to list it for $169K. We are seriously interested in the C8 but not at that price. I consider $100k to be my very top and that is high for a CAR. At that price point they will be selling to a different clientele and Corvette ownership as we know it will come to an end. I used to be on the Northeast forum exclusively. Members actually met for different events, so there really wasn't any anonymous posts as most of us knew the poster. It was fun times but things and people change. 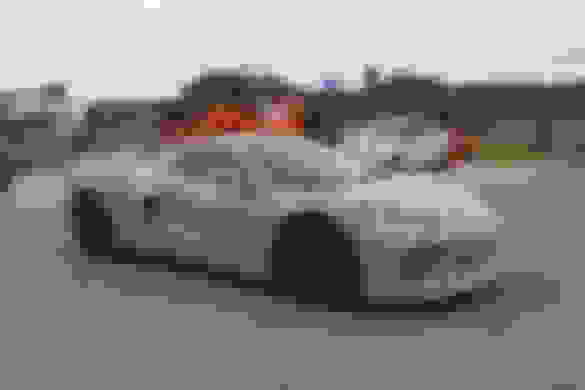 Sad to see that from fellow corvette enthusiasts. Planet 9 is another. I bought a 718 Boxster and quickly realized I didn't own a real Porsche according to them. So there are plenty of jerks to go around everywhere, not just in one place. LOL, your guess at the C8 pricing IS a hypothetical! That's classic...good job! We were looking at a 2019 Grand Sport 3LT auto. A little over 80k. We decided to wait for the ME but will probably reconsider if the price is anything over 100k. And it better not be entry level at that price either. Update: I found a 2019 "brand new" at the dealer with all the extras we looked at, now for sale at $72,834. That may be a game changer for us. Just got off the phone with my Uncle's Cousin's friend and can confirm the base is going to have a 4cyl and be called the Buttefly Ray. The new post where the guy talks to the lady is very accurate from my intel. The car doesn't look that impressive... Looks kinda like a C7 with a body kit... Or a modern Pontiac Fiero. The rear end is not that great... And the front bumper looks horrible. F1 KERS has a 160 hp for short bursts that uses only a ~30 lb Li-Ion battery. It recovers all it's energy when braking and is an energy saver and power booster. Therefore 320 gasoline + 160 electric = 480 hp, 20 more than the current LT1! This is what it will do: After Stop/Start in "normal cruising/driving" the KERS electric motor will power the car from a stop to about cruising speed before the gasoline engine starts. When driving in anger, say from a stop light, both the gas engine and electric moor would operate. When braking some of that energy would go to recharge the KERS battery. The above is obviously only my fun speculation as is Butterfly Ray! I expect the C8 and other vehicles will have a KERS (Kinetic Energy Recovery System,) but expect that will be sometime after the first year! Last edited by JerryU; 12-18-2018 at 05:06 PM. F1 KERS has a 160 hp for short bursts that uses only a 30 lbs Li-Ion battery. It recovers all it's energy when braking and is a great energy saver. This is what it will do: After Stop/Start in "normal cruising/driving" the KERS electric motor will power the car from a stop to about cruising speed before the gasoline engine starts. Is all we care about is power? What about the sounds an engine makes? Last edited by MitchAlsup; 12-18-2018 at 04:20 PM. Color me surprised. I am a member on Planet 9 and frequent the 981 forum. In over 5 years posting and reading there, I have NEVER heard that about the Boxster/Caymans. I HAVE heard that directly in person from 911 owners. To bad they are so closed minded about Porsches. My Porsche driving instructor told me that the Boxster/Caymans are actually the best track cars Porsche made. They are hampered directly by Porsche so they don't outshine their 911 halo car. Things like sound are important. But what I described would sound fine as when NPP opens wide! If you put your foot to the floor the KERS would come on full power AS WOULD THE ENGINE! Lots of noise. Far better than an all electric. I have a solution to an all electric that could also be incorporated with Stop/Start. Have the sound system play, perhaps superimposed on whatever music and at a controllable level the sound you select! I'd pick a Columbo V12 or perhaps a AA/Fuel Funny Car at idle! The gasoline engine has a way to go to use some of the now wasted energy in gasoline. 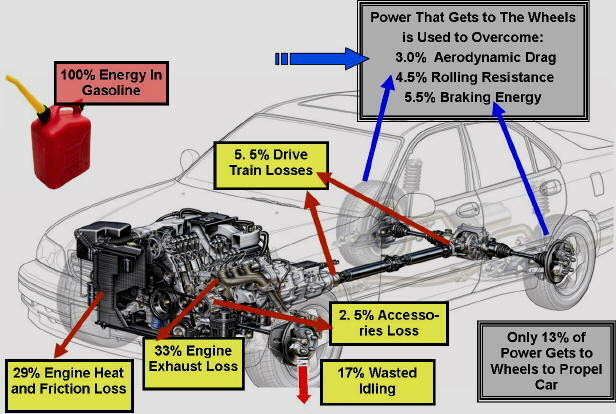 Granted the figure below is an average and taken from EPA data a few years ago BUT as you can see only ~15% or less energy in gasoline gets to propel the car. A great deal is, on average, wasted idling; ~30% goes out he exhaust as wasted heat as does ~30% out the radiator etc to heat the surrounding air. Of the ~15% that does get to the rear wheels about 1/3 goes back into heat when braking. Some of that energy can be recovered. Now thermodynamic laws say we can't recover it all BUT we can do a lot better. F1 has improved the efficiency of their race cars over 50%. They no longer are allowed to refuel. They are beating race times on some of the same old tracks for the same length race with a 1.6 Liter 800+ hp turbocharged engine compared to much lager V12's of the past. There are many things than can be done before we go all to electric cars that currently get electricity from ~85% hydrocarbon fuel! 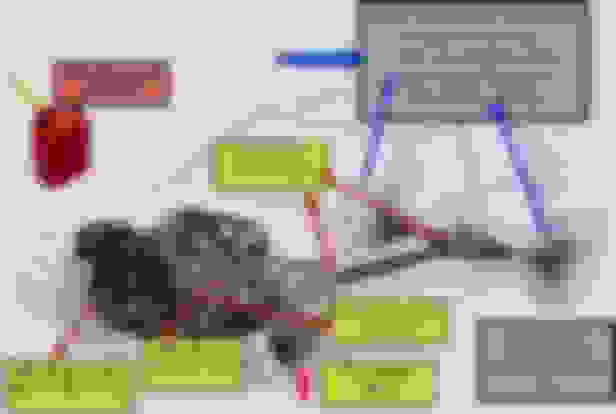 Last edited by JerryU; 12-18-2018 at 05:36 PM. I don’t know how well GM could make and implement a KERS system, but I’d 100% support any gas-powered vehicle that uses one. Just think about this: a KERS system will allow this V12 to pass emissions testing AND will supplement it with over 100hp and lots of instant torque. Of course, this the absolute epitome of powertrain engineering in the production car industry.